This was going to be a lunch like no other: If you weren’t sharing a table with Big Bird, you might be gazing at a masterpiece painted just for you. Or imagine spooning out your salad dressing as royalty, the crown on your head matched only by those of your fellow royalty at your table. It’s shades of Versailles, in the name of helping Collier Countians in need. That is the fundraising goal for the event’s sponsor, the League Club of Naples. The club changed its fundraising luncheon this year to inject a fresh — and local — perspective on the event, which has raised $4.5 million for local needs since its 1986 founding. 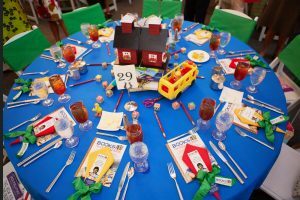 So in addition to bringing revered designer and speaker James Farmer, the organization invited designers, both local and with a local following, to create high-theme tables for its annual luncheon Monday. The result, for the 650 people who walked into the pavilion of the Ritz-Carlton Golf Resort, was a culinary riff on Wonderland — themed fantasies with place settings in a paint box of colors. In one corner, Laura Michaels’ tropical centerpiece rose 11 feet from the table top with a stand of bamboo and authentic Indonesian root shells, painted and scooped to represent plate chargers. Michaels took her inspiration directly from Naples. “I was down here with a group of architects and I felt it was such a tropical place. I wanted it to feel as though you’re in a tropical oasis.” The Greenwich, Connecticut, designer had strung raffia pendant lights and added reed pillows to the chairs: “Just a little more texture,” she said. “I was watching a lot of series that are about royalty, ‘The Crown,’ ‘Victoria,’ and like that. So I decided to do something in that line. I was trying to make something fun for the table,” he said. Organizations that have been beneficiaries of League Club awards were invited to submit a table design as well. Books for Collier Kids spread its table with tomes, alphabet blocks and character statuettes such as Big Bird. What took longer was tie-dying the napkins, painting the starfish favors periwinkle blue, blowing up the baby beach balls and glazing the bottles that sat at each place. Jett Thompson of Naples created two tables, one of which would take its guests back to Africa, her favorite place to travel, in shades of coral, green and black. Allison Parker, designer for Lilly Pulitzer of Waterside Shops, punctuated the trademark near-neon shades of Pulitzer with bowls of oranges, hearkening back to the founder’s beginnings as a Florida orchard owner with her husband. 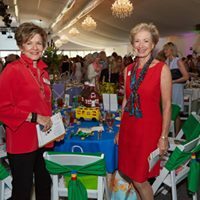 Through the efforts of former board president Rose Wick and Executive Director Hyla Crane, Marco Island Center for the Arts created a locally furnished table. Awaiting its diners were clay flower favors from its potters and framed miniature paintings for each place setting, painted by Sandra Esham of Naples. Not every table designer came from Naples, but most had ties to the city, with clients here. Those included Boston-based Anthony Catalfano Interiors Inc., which spread mounds of hydrangeas, roses and green moss visuals down its table in a mass of 680 blooms. Another pair of designers were known here only because they have a strong Instagram following in Naples. But that convinced Lance Jackson and David Ecton, founder-owners of Parker Kennedy Living in Atlanta, that they wanted to be here with their Asian-inspired table. “We even brought our own chairs from home,” Jackson said.